Dr. A K M Nowsad Alam has written 14 books, 3 booklets, several leaflets and a series of popular articles on different aspects of fish processing, marketing and resource utilization, quality assurance of fish products, packaging of fish and fishery products, community empowerment and coastal fisheries resource management, many of them are published by the FAO. Important introductory information about selected six books are given bellow. This is a text book/ ToT training manual for the undergraduate/graduate students and extension workers who are engaged in the promotion of fish processing in the country. The basics and tools of fish processing used in Bangladesh are presented in the form of a completely participatory new approach of ToT. To establish an effective training network [Core Trainer – Extension Worker – NGO personnel – Target Community] and to smooth up a feed-back flow at each level, a comprehensive training approach needs to be introduced. In accordance with such approach, in this book, an activity-based delivery of the topics is designed where the students/extension workers can be able to learn the things through the participatory activities before the field based practical sessions are conducted. This book describes a new training approach that was developed and introduced for conducting training of trainers (ToT) for the GO-NGO extension workers. The ToT was brought into the field and made effective avoiding classroom based approach of delivery. A self-facilitated fully participatory training technique was applied. Beside the principles and applications of the new ToT, this book covers the best possible choice of appropriate fish processing technologies particularly suited for small-scale processors. These include post-harvest handling and distribution of fish, icing, freezing, sun-drying, smoking, salting, fermenting, packaging of fish and quality control of domestic fish products. 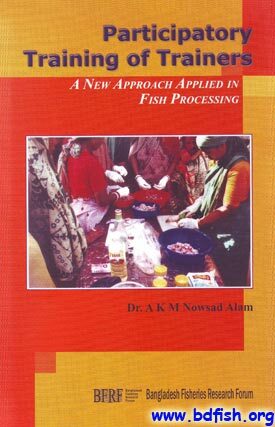 Adaptable improved techniques of fish handling, preservation and processing and low-cost, sustainable and user/ environment friendly technologies developed by participatory stakeholder-based methods have also been included in this book. Fish processing methods are presented in learners’ friendly ways as information pools to support the hands-on lab or field based practical sessions. 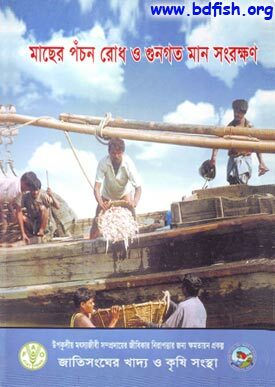 This book is published by the BFRF (Bangladesh Fisheries Research Forum). Total page 328. Ecopy of this book is available here. 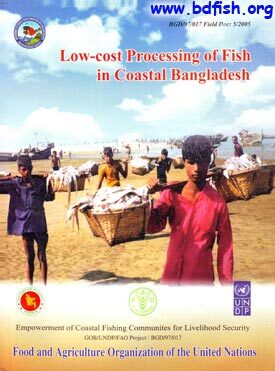 A reference book with detailed description of low-cost traditional processing and packaging of fish in coastal areas of Bangladesh. The reduction of post-harvest loss and improvement of the quality of the traditional products are two important ways by which a characteristic change towards empowerment of the poor fishermen and small-scale processors can be achieved. Both reduction of post-harvest loss and improvement of the quality need that the traditional and low-cost small-scale fish processing should be known to the innovative activists, extension workers, developmental partners like NGOs and foreign donors, universities, research institutes, government agencies, policy makers, researchers, teachers and students. 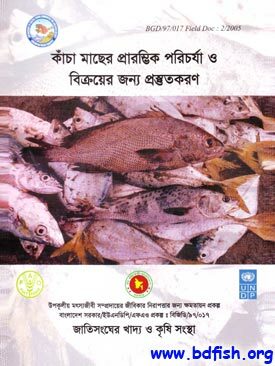 With this aim, the data generated during extensive field visits and baseline survey of the FAO Project (BGD/97/017) and suggested improved methods developed by participatory stakeholder-based approach, which are field tested and being practiced by the community have been compiled, that leads to generate this reference book Low Cost Processing of Fish in Coastal Bangladesh. Published by the FAO (Food and Agricultural Organization). Total page 88. This is a training manual/text book introducing new ToT approach written for students/extension workers in Bangla. Fish Processing is a new subject, not only to the target fishing communities, but also to the GO/NGO extension workers of the country, who have long been acquainted and handled only with aquaculture related issues. To bring this new topic in a training course, careful selection of curriculum and use of easy and learners’-friendly phrases were felt important. For this purpose, a simplified manual with easy explanation of the practices is prepared. Complex theories are avoided. Traditional process line, associated constraints and scope for development with suggested improved practices are highlighted. All these simple information are provided through the new participatory self-facilitated ToT approach. Published by the FAO (Food and Agricultural Organization). Total page 85. A community manual written in Bangla on Appropriate Icing of Fish. Simple methods of icing, nature of ice box, water for ice making, quantity of ice required for icing, etc are described. Published by the FAO. Total page 09. Handling of wet fish is a delicate practice since most of quality deterioration occurs due to mishandling of newly died/caught fish. It is important because, quality does not deteriorate at this stage but exert hidden multiplier impacts, if any mishandling done, at later stages in the hands of other stakes in the distribution channel. Therefore primary fish handlers should take the responsibility to handle fish carefully, so that a prime quality can be retained at the later stages. 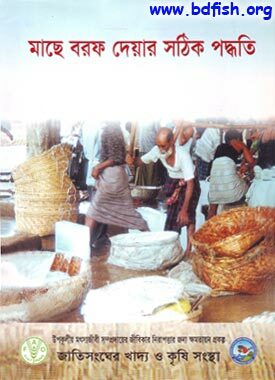 Keeping the theme in mind, this book has been written in Bangla to aware the primary fish handlers, like farmers, fishers and traders, on handling and preparation of wet fish for distribution and marketing. This book describes the types and features of fish processing room, fish box, containers and utensils for the preparation of fish, importance of fish washing, nature of wash water and packaging and value-addition in wet fish. Although targeted for primary handlers, the students and extension workers can also draw immense benefit from the book. Enthusiastic entrepreneurs can adopt the techniques to initiate wet fish preparation and value-addition enterprise. Published by the FAO in 2005. Total page 44. 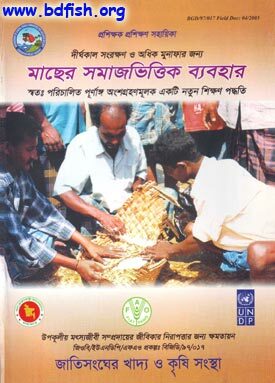 A community manual written in Bangla on spoilage and keeping quality of fish. Fish is the prime supplier of protein in Bangladesh. Fish encounters huge post-harvest losses, both qualitative and quantitative, for many reasons. Careful handling can reduce both types of such losses. This book describes the reasons of post-harvest losses in fish and measures to stop or reduce such losses. Therefore, improved post-harvest handling and pre-processing are presented in easy language. The primary producers, fish traders, transporters and processors will be particularly benefited from the book. Extension can use this as a handy reference book. Published by FAO in 2004. Total page 24. Dr. A K M Nowsad Alam; B.Sc. Fisheries (Honours.) and M.Sc. in Fisheries, M.S. and Ph.D. in Fish Processing Biotechnology and Biochemistry and Post-doctorate in Marine Bio-engineering and Biochemistry is a Professor of Fish Processing, Quality Control and Seafood Safety. He has worked as a Senior National Expert in the FAO Bangladesh on Livelihood Development of poor coastal fishers through Fishing, Fish Processing, Quality Control and Coastal Resource Management for more than 4 years. He is a recognized teacher of Stirling University UK on Distance Learning Master Degree of the Stirling University. He is sound in health, a diligent, candid, flexible, up-front and dynamic quality-oriented person, spirited for team work, ready to go beyond assigned tasks and cut out for extensive grassroots level fieldwork. He is conscience-oriented and always does his best to contribute to work-flow. He has kept up superb academic and professional records throughout his professional life. He has more than 80 research publications, most of which are in the peer reviewed international journals of the USA, UK and Japan. He has written 14 books, 3 booklets, several leaflets and a series of popular articles on different aspects of fish processing, marketing and resource utilization, quality assurance of fish products, packaging of fish and fishery products, community empowerment and coastal fisheries resource management, many of them are published by the FAO. He has sound background and expertise on both artisanal and commercial fishing and fish processing enterprise development and quality control of fishery products of Bangladesh, their constraints and solution options developed with the beneficiaries and with different local and international organizations and donor agencies. He has hands on experience on working with fishing and processing industries for developing good manufacturing, marketing and packaging practices and establishing HACCP. He has pioneered a model of highly participatory self-facilitated training of trainers (ToT) for agricultural extension – the approaches and methods are documented and published by the FAO and BFRF. He can communicate fluently in spoken and written English, Japanese and Bangla. He has top level management and coordination skills as he has served as the senior level Expert and in-charge of a project of FAO, Head of the Department in the University, Manager of Fish Farm, House Tutor of student hall, Senior Officer in a nationalized bank, etc. He has collective, conceptual, analytical coordination and management skills with competence in designing, developing, planning, implementation, monitoring and evaluation of development and research projects, vertical and horizontal communication in project management, human resource development, training and extension of livelihood components, GO-NGO coordination, logical frame-work development, sustainable livelihood approaches, mobilization of communities and their grassroots institutions and empowerment of coastal and rural disadvantaged communities through the improvement of small and medium scale fish processing enterprise. He has developed several technology packages for the improvement of fish processing and quality control sector of the country, like low-cost solar fish dryer, low-cost ice box for effective handling and transportation of wet fish, improved racks and tunnels for plain sun-drying of fish, improved earthen oven for smoking of shrimp, value-added products like fish sausage, fish ball, fish stick, etc. The technologies have been transferred to the field and are being profitably used by the communities. Visited 11,522 times, 2 visits today | Have any fisheries relevant question?